Warning lights flash, nearly forty-centimetre thick safety doors close, a warning signal sounds. 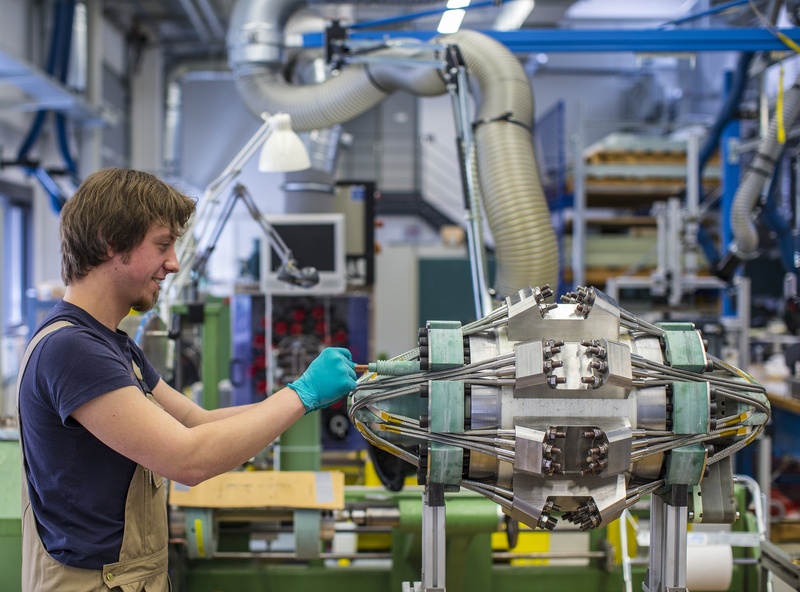 When it gets serious at the HZDR's Dresden High Magnetic Field Laboratory (HLD), nobody is allowed to remain in the vicinity of the bucket-sized coils that produce the almost 100 tesla strong magnetic field. Yet the safety precautions are less designed to protect from the magnetic field itself than from the consequences of the potential tearing apart of the coils. Although this happens only in extremely rare circumstances, it cannot be ruled out. The forces at work here are enormous: the threshold at which a coil made from ordinary copper wire simply tears apart is at approximately 25 tesla. The coils at the HLD are therefore made of a particularly durable copper alloy and are moreover wrapped in zylon, an artificial fibre that is used also in making bulletproof vests. The force at work here is better known to most people from what they learned in physics lessons than from their own experience. The Lorentz force is always involved when electric charges move within a magnetic field. And when electric charges move, that is, when current flows, formation of a magnetic field will always be the resultant consequence. The stronger the current, the stronger the magnetic field and the Lorentz force. It retroacts to the electrons moving within the copper coils and presses them to the margins of the copper wires. "At 100 tesla, it produces a pressure in the copper that corresponds to 40,000 times the air pressure at sea level", says Joachim Wosnitza, Director of the HLD. Normal copper wires would fly apart with explosive force, yet the special copper wires in their zylon skeleton withstand this strain. In addition, the coils are embedded in a bath of liquid nitrogen, for otherwise the electric resistance would heat up the wires to such high degrees that the glue holding together the wire and the zylon corset would simply give out. In this configuration, the electric impulse causes the temperature of the wires to increase from minus 196 degrees Celsius to room temperature. However, high magnetic field laboratories are not about achieving records, but about researching materials and their electromagnetic characteristics.The stronger a magnetic field is, the better the researchers can investigate these characteristics and, more importantly, can influence these in a targeted manner. For strong magnetic fields are capable of influencing the electron trajectories and their magnetic spins and thus of changing the characteristics of the given material. And precisely those characteristics play such a major role in our modern world. The researchers investigate new kinds of semi-conductors and superconducting materials that lose their electric resistance at low temperatures. An example: only a few years ago, British researchers discovered graphene.This material consists of carbon atoms, which are arranged in a lattice of a single layer of atoms. After the scientists had created graphene for the first time, they investigated it in a high field magnetic laboratory and discovered its unique electronic characteristics. A discovery that earned Sir Konstantin Novoselov and Sir Andre Geim the Nobel Prize in Physics and that in future could help in producing bendable mobile phone displays. Only about a dozen such high field magnetic laboratories exist worldwide. This is why scientists from all across the world travel to Dresden to conduct experiments in high magnetic fields. A particular advantage of the facility in Dresden is the size of the cavity in the interior of the coil where the samples are located. With 16 millimetres, it is larger than those at comparable other facilities. The world record is currently held by colleagues from Los Alamos in the United States of America. In March 2012, they were able to achieve the magical 100 tesla mark. The 100 tesla mark is aimed for also in Dresden. "Our technicians and engineers are currently working on a new coil, so we are hard on their heels", reveals Joachim Wosnitza. Among the natural-science fields of activity, material research is one of the less glamorous. But some materials have the potential to become a hit – and this is valid, once and for all, for graphene. Erin Koos has developed a new method that can improve material properties. Since August 2013, the European Research Council (ERC) supports her work at the Karlsruhe Institute of Technology with the ERC Starting Grant. Two flashes – one world record!